Goodreads: Divorce attorney Harper James can't catch a break. Bad enough that she runs into her ex-hubby, Nick, at her sister's destination wedding, but now, by a cruel twist of fate, she's being forced to make a cross-country road trip with him. And her almost-fiance back at home is not likely to be sympathetic. Harper can't help that Nick has come blazing back into her life in all of his frustratingly appealing, gorgeous architect glory. But in Nick's eyes, Harper's always been the one. If they can only get it right this time, forever might be waiting just around the bend. 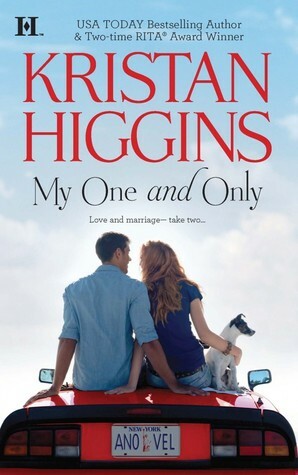 Kritters Thoughts: My new favorite Kristan Higgins book. A story about a girl who has avoided love afer an intense break up and divorce. At first I didn't understand her apprehension towards love and commitment but as the story slowly unfolded - which I loved, I was able to completely understand her story and why she was the way she was. I loved the unfolding love triangle and really wasn't sure where our main character would end up - which I love. Sometimes my favorite part of a book is when I guess wrong! I flipped and flopped back and forth as to which guy I thought may work better for her. I am still not sure if I like the road she chose, but I was glad that I didn't know too far ahead of time. The ease of reading made me rate it as a perfect beach read - I was on my way to Vegas for a work trip and it was the perfect companion while travelling. Definitely a read for an audience of ladies! I've never read anything by this author but this definitely sounds like a fun read! I read this last week and really liked it. It really is a perfect beach read!